I've got first day of term blues (hence the miserable face in all the photos) students get excited to be back and see all of their mates, I just feel old and miss my uni days. Boohooo! I am looking forward to seeing Sarah this weekend though and I'm happy to see the return of all the lovely term time only staff that I work with. 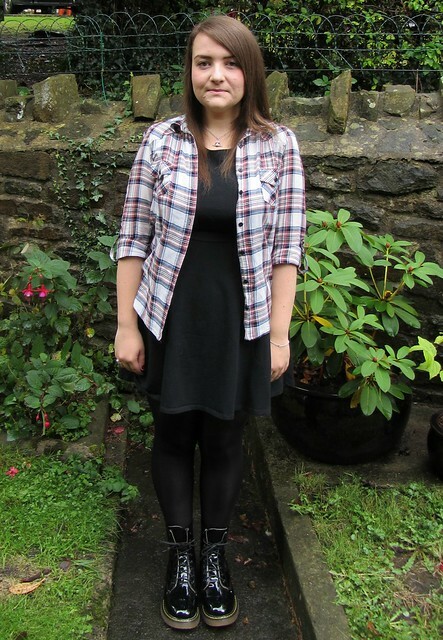 I bought this dress when Topshop had free delivery because the store never had my size. 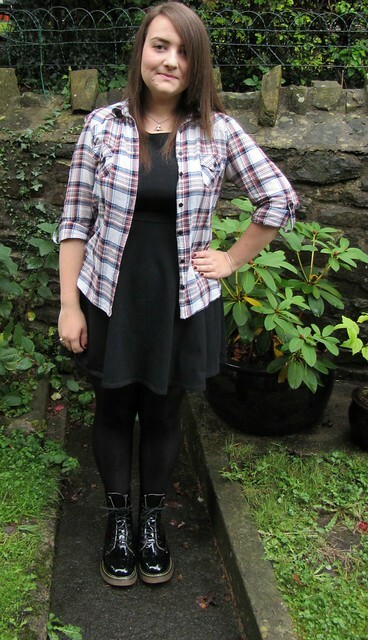 It was £18 with student discount and the fit is great. I've now also got this dress in navy because I love it so much, can't go wrong with a plain jersey dress. 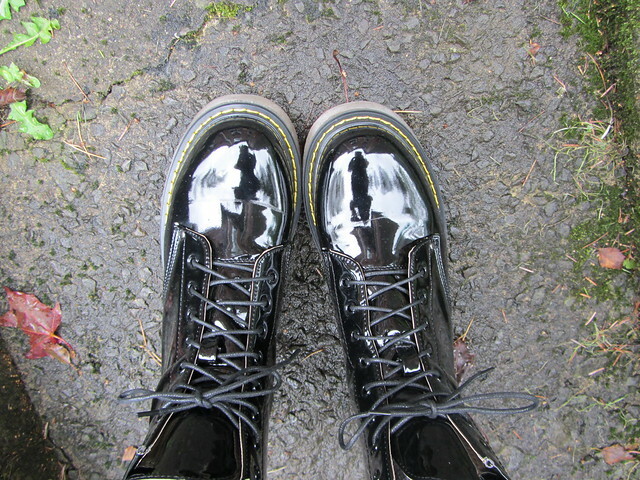 Apparently there is flooding across the UK and the skies looked pretty grey when I left the house so I took the oppourtunity to wear the practical boots that Daisy Street sent me. The boots have gone through puddles and my feet have stayed dry and I wore them to work and there aren't any marks of scuffs on them like I was expecting because they are so high shine. I think these boots are a bit of a bargain at £24.99 as real Dr Martens are over £100. I know the real deal might last a lifetime but I'm fickle when it comes to fashion and these are the next best thing. Hope all of you students returning to uni have a fun freshers week. If it is your first year and you're new, don't be afraid to ask staff (people like me in the library) questions, it's what we are there for. If you are going to Cardiff Uni come and say hi to me! These are so handy for this horrible rain! Those boooots! Perfect for this weather, or all year! Nice boots and what a bargain! oooh not heard of secret sales before, will check it out! Those boots look lovely, I could definitely be doing with a pair like that today for going out in this horrible weather! I've always fancied a pair of Dr Martens but was worried I wouldn't wear them that much, might have to treat myself to a bargain pair instead! Two of my friends have transferred to Cardiff! Their PhD supervisor got a job there and they went too. I'm planning a visit! Ah you look lovely, not a grump at all. Love the boots! I have no patience for investing in expensive shoes (with the exception of Irregular Choice) so I'm totally with you there. Always buy the shiny ones!